#1 Heart 3-D Silver Baseball Charm Toggle Bracelets - Softball & Baseball Jewelry, etc. 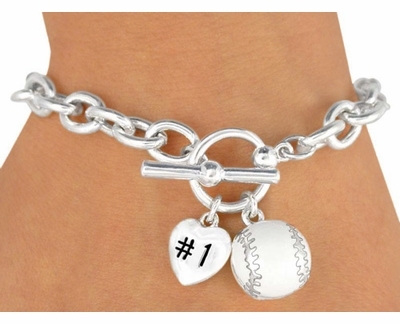 This very modern and stylish Baseball / Softball Charm Bracelet features an 8" long Polished Silver Toggle Chain Bracelet with a Silver Heart Charm that reads #1 and a bright Silver 3-D Baseball / Softball Charm. Love Baseball Charm Bracelet Measures 8" Long.